A tragedy in a metropolis ended up helping to create a device that will be mainly used in a much more rural setting - an upper arm prosthetic specifically designed for use with heavy farm equipment. From left: Northeastern University students Carly Gajewski, Danny Walsh, Jake Cohen, Andrew Waite and Jonathan Leydon displaying their Farm Arm prototype. The students’ invention, Farm Arm, has a prosthetic terminal device with a set of adaptors that can be switched out depending on the controls of the farm machinery being used. The adaptors are plastic and were made with a 3D printer. The students, Danny Walsh, Carly Gajewski, Jake Cohen, Andrew Waite and Jonathan Leydon, found there was a need for a better prosthetic in the farming sector, an industry where there’s a high incidence of amputations. According to the National Safety Council, one out of every 10 agricultural workers will suffer an amputation while on the job. While most involve a finger or a toe, about one out of every 200 incidents involves a major limb amputation. The Farm Injury Resource Center reports that farm accidents are two and a half times more likely to end in an amputation of some sort over any other injuries. Walsh says most prosthetic manufacturers “are not always designing for the specific needs of a farmer,” but are instead focused on electromechanical technology that replicates how the human hand moves, which is expensive and requires the use of batteries. The problem with that, he says, is “if you’re out there farming and you have this very fancy device,” you might be limited by battery life or other factors. Most farmers, Walsh says, rely on what’s called a worker’s hook, which uses curved metal pieces with a pulley system to work. 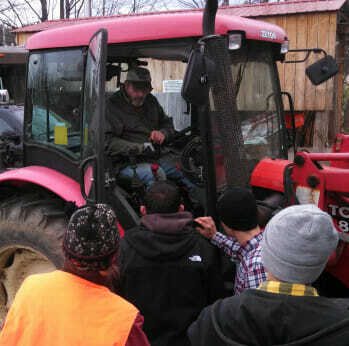 While the device “helps them accomplish most of their tasks,” it doesn’t do a great job with a tractor’s rounded controls or its steering wheel. Walsh and his teammates had only four months to complete the project from research and brainstorming to machining the parts to what he calls the “validation test,” which, in this case, meant working with a farmer to put the prototype through its paces. They worked with farmer Robert Cameron of Rumford, Maine, on this part of the project. Walsh says the team was connected to Cameron through Maine AgrAbility, which assists agriculture workers with disabilities. The team is still refining the arm based on what they learned while working with Cameron and are building a second prototype with a more flexible wrist. In April they’re heading to a national AgrAbilty training workshop in Rochester, N.Y., put on by Purdue University. From there they hope to market and manufacture the Farm Arm. For more information on Farm Arm, contact the team at [email protected] or go to thefarmarm.org.